After refueling, turn the fuel tank cap until you hear a click. Once the cap is released, it will turn slightly in the opposite direction. 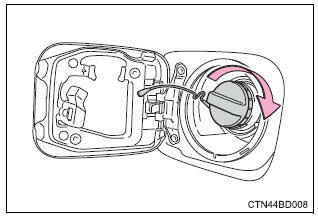 Do not use anything but a genuine toyota fuel tank cap designed for your vehicle. Doing so may cause a fire or other incident which may result in death or serious injury.